The photos that appear in family albums, especially old photos, are always fascinating. With the costs and time restraints of photography in those days, one could not just photograph whatever they wished. It was with interest that this photo is contained in the album of my Great Grandfather, David Delos Donaldson. This photo was taken in the summer of 1919. 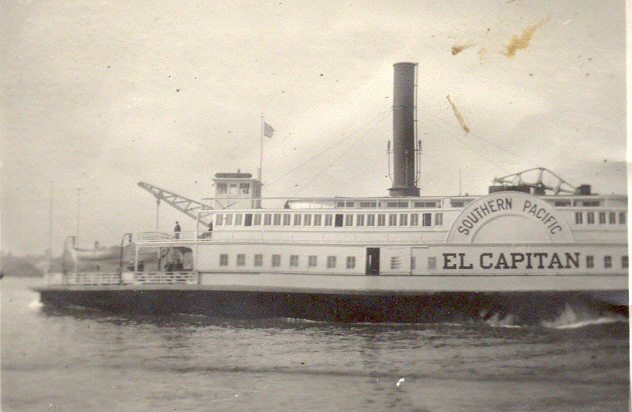 The El Capitan was a ferryboat (982 tons) commissioned by the San Francisco & Oakland Railroad in 1868 and built in Oakland. This ship was still in service as of 1919, which seems pretty impressive for the longevity of a ship. SF&O was later absorbed into the Southern Pacific Railroad. While El Capitan had served the San Francisco to Oakland route for many, many years, by 1919 she was serving Vallejo Junction to Vallejo. I could not find out when she quit service. Why take a picture of this ferryboat? Did he ride it while he was in the army before heading off to France? Did Dena, his wife, find it interesting because it was the first ferry she ever saw? Unfortunately, we will never know in this life. This entry was tagged California, Donaldson, Oakland, San Francisco, Vallejo. Bookmark the permalink.